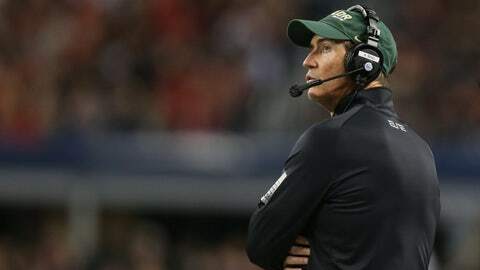 Baylor coach Art Briles will lead the Bears into the Fiesta Bowl on Wednesday against Central Florida. GLENDALE, Ariz. — The king of Texas football is moving. Not from Waco, but from venerable Floyd Casey Stadium to a $235 million campus facility on the banks of the Brazos River. You can call it the house that Art built. Art Briles has turned No. 5 Baylor, Baylor, into the highest-ranked and perhaps most recruit-friendly football program in Texas — and it might be safe to include the state’s two NFL teams in that grouping. At some point, suitors seem certain to surround the sage of Stephenville, perhaps with an offer he cannot refuse. But as the new year commences, Briles reigns over a program that is a model of success through creativity, with an offense as wide open as the state in which he was born and seems forever wedded. When he is not devising ways to turn a 120-yard by 53.33-yard rectangle into a torture chamber, Briles likes music, barbecued brisket and relaxing on the back porch with his wife. Lyle Lovett could play him on screen. Or maybe John Wayne would have been a better fot. Briles believes in the three Fs of football — fast, fresh and physical — and he presents his program in a way that creates a bond with his players, a human touch that he believes is the key to everything else. "That cracked me up," quarterback Bryce Petty said. "I don’t know where we were, what game we were preparing for, but he said that and I died laughing." "One of the things we talk about at Baylor is the standard.," Briles said. "We’re not going to compare ourselves to anybody else. We’re not going to look to see what anybody else is doing. We’re going to do what we do and try to do it better than anybody else in America." The son of a coach, Briles worked his way up from four state championships at Stephenville High in central Texas one Big Chief tablet at a time, doodling with Xs and Os as an assistant at Texas Tech and later as the head coach at the University of Houston, where he led a similar turnaround as the one in Waco. In some ways he is college football’s artist in residence. His offense is about spacing and angles and the controlled amnesia inherent in running a play every 17 seconds or so. With wideouts lined up outside the numbers and the tight splits of the offensive line, Briles’ offense seems to create an extra layer of space on the perimeter, leaving skill people room to run free. Quarterbacks Robert Griffin III, Nick Florence and now Petty guided the Bears to the top of the offensive charts the last four seasons. The Bears average 624.5 yards a game this season, a half-football field more than No. 2 Oregon. They gained at least 400 yards in 38 of their past 39 games. They average 53.3 points a game this season and scored at least 40 in 23 of their past 28 games. "I think everything’s about timing," Briles said. "It’s about people. It’s about environment. It’s about atmosphere. It’s about trust. It’s about having a vision, having a plan, having the inner soul and toughness to follow it through without deviating. We’ve always felt like we do what we do, and we’re going to continue to do it ’til we do it as well as we can do it. That’s from a philosophical standpoint along with schematically." Such success was not always the Waco way. Grant Teaff, later the executive director of the American Football Coaches Association and a member of the college football hall of fame, built a solid program and made two Cotton Bowls in his 21 seasons as head coach, but national and local notoriety went more often to Texas or Texas A&M, or maybe Eric Dickerson’s SMU. After Teaff retired in 1993, the program was about as dry as McLennan County. Baylor had 12 straight losing seasons after moving from the Southwest Conference to the BIg 12, had the seventh-longest bowl draught in Division I and went 17 years without being ranked in the AP poll. There were not enough Mike Singletarys to keep the program from sinking. Petty grew up in the Dallas suburbs, and like other Texas high school recruits noticed all that. He was asked earlier this week if he believed the Bears understood the significance of the program’s climb since Briles arrived in 2008. "I would like to say yes. At the same time, I don’t think there’s any way that we could," Petty said. "Those (down) seasons, we probably weren’t looking at Baylor. Being football guys, you want to get recruited and go to a top school. Really, Baylor is not on our map … we all took a chance on Baylor. That’s where the vision of Coach Briles really took off. It all started with him." If notoriety comes with a target, so be it. "You like to have the target on your back, your chest, wherever they want to put it," Briles said. "If people are not shooting at you, they’re not respecting you. We’re just trying to earn respect. It took us four or five years to get there. Now we are going to have to work hard to make sure we maintain that level of respect that people finally have for us."